Helping employees gain satisfaction in their leisure lives and a healthy work life balance can increase their enjoyment of work, their job satisfaction, their health-and their productivity. We know that many forms of leisure experience are linked with improved health. Not only will healthier workers spend more time on the job, but also they will have lower health costs. The transition into a new job often means changes in work schedule and demands, relocation-and a change in one's leisure life. Leisure education workshops for new employees provide mutual benefits for employees and employers, ultimately reducing turnover and increasing overall health. 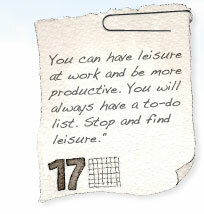 There is evidence to show that leisure is linked to productivity. Adults have been shown to be able to maintain higher attention levels when they have more frequent breaks. Several U.S. and Canadian studies show that leisure programs "increased productivity by seven percent while decreasing absenteeism by 20 percent." Employees may find a renewed sense of purpose for its own sake. Skills learned in the context of leisure education carry over into professional functioning. Individual social interaction and communication skills improve, and group interactions become more productive. Creativity increases, and problem solving skills may be enhanced. The Leisure Link can help human resources departments, senior leadership and department managers to realize these and other benefits for their employees. We can focus on counseling specific employees or work with groups through training, workshops, retreats or staff development days.